Southern Alberta has become one of my favourite destinations in the past couple of years, one that I am fortunate to be able to reach with an easy half-day road trip. I love the larger-than-life Alberta skies and the vast, flat, golden prairies. I love how the landscape can change so quickly and how the Earth opens up in front of me to reveal something completely different. 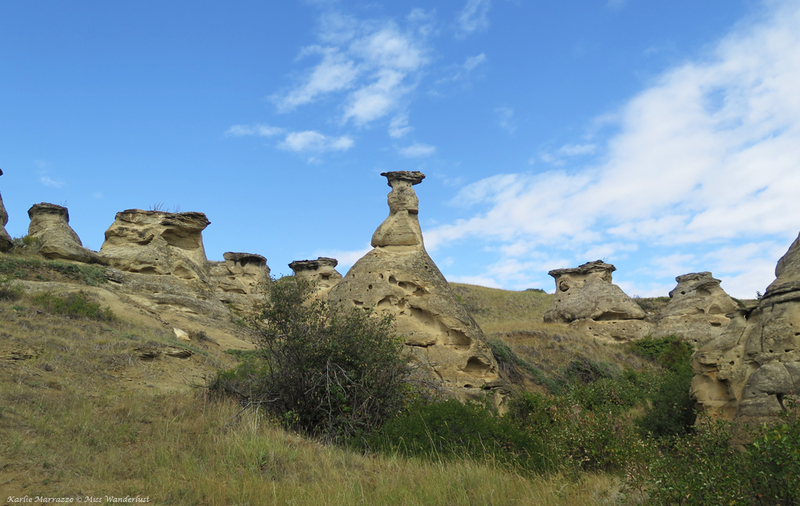 For this year’s Alberta exploration, I started with two nights in Cypress Hills Interprovincial Park before moving on for two more at Writing-On-Stone Provincial Park/Áísínai’pi National Historic Site. A few weeks before the trip, I rifled through a box of books my aunt was donating to Goodwill. I came across a book called A Traveller’s Guide To Geological Wonders In Alberta that had been published by what was then called the Provincial Museum of Alberta and grabbed it without thinking much of it. I tucked it into my bag and casually flipped through it when we were on the road and found the entry for Rock Coulee. It wasn’t far out of our way between Cypress Hills and Writing-on-Stone, so we made the detour. The landscape between the two is flat and repetitive, and if I drove by the road sign for Red Rock Coulee without knowing about it beforehand I probably wouldn’t have pulled over. The parking lot was empty when we pulled up, our wheels kicking up dust behind us. The afternoon heat was at its peak and there wasn’t a cloud in the sky. A vast, undulating valley opened up beneath us, with massive rust-coloured rocks strewn about haphazardly. Images of angry space giants smashing terracotta pots to the Earth from Mars flashed through my mind. People are free to walk around amongst the rocks and even climb on top of them. 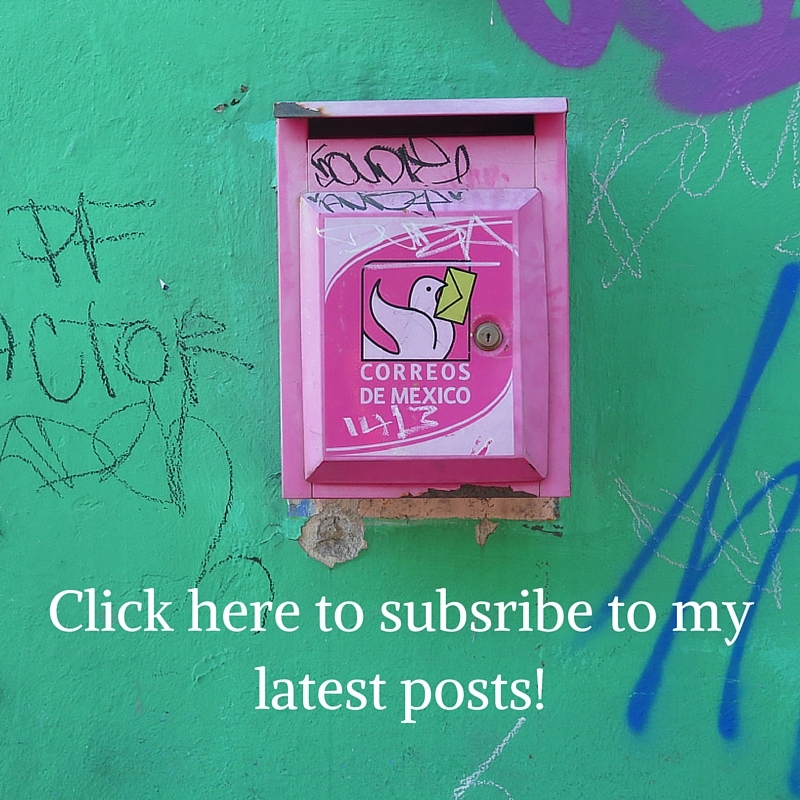 As a well-behaved, rule-abiding traveler, this was out of the ordinary to me, but I reveled in it. 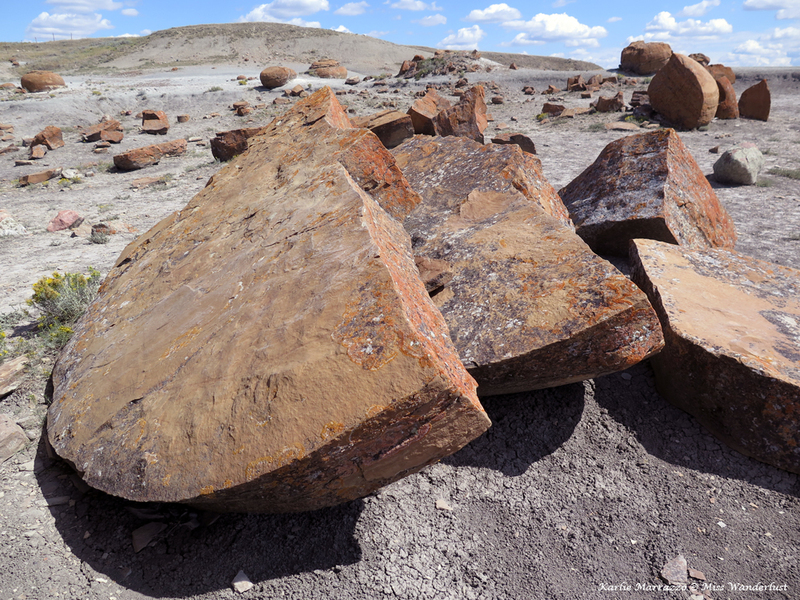 The large red rocks aren’t intergalactic debris, however, but spherical sandstone concretions that have eroded out of the softer bedrock, according to Alberta Parks. The rock formations vary in size up to 2.5 meters and are believed to be among the largest in the world. We roamed the celestial landscape for an hour before moving on. I would love to return at dawn or dusk to get some really out of this world photos. Much like Dinosaur Provincial Park 260km to the north, Writing-on-Stone Provincial Park sneaks up on you, a slash in the Prairies opening up to reveal a completely different landscape. 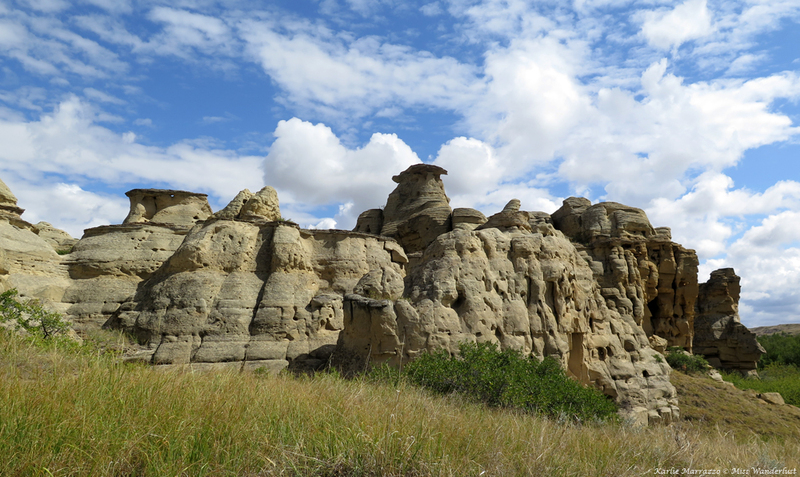 We drove down the gently sloping road into the campground, a wall of limestone hoodoos on one side and a lush valley along the Milk River on the other. I’m not a fan of traditional camping, but we had such a great experience with Alberta Parks Comfort Camping at Dinosaur the previous year that we booked one of the luxurious tents again this year. 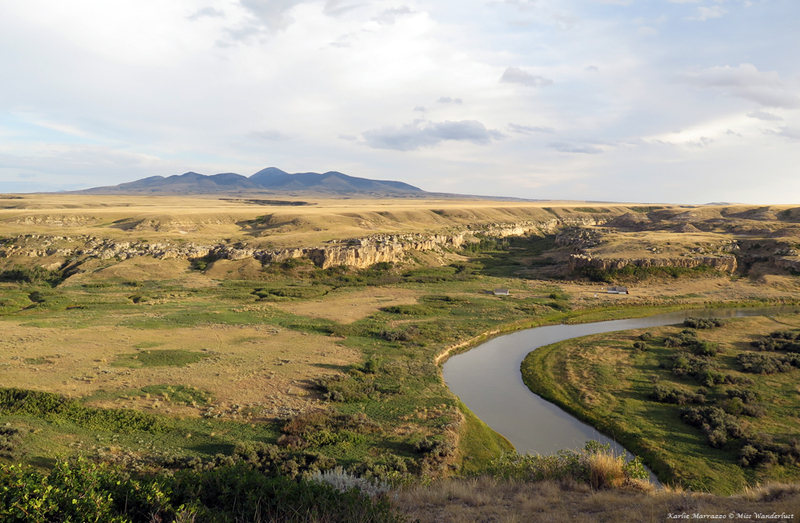 We made ourselves at home in our canvas tent before driving up to Police Coulee viewpoint, a high point overlooking the valley, Milk River, and across to the Sweet Grass Hills in Montana, only about 10km away. We settled into our camping chairs and were surrounded again by absolute silence. The landscape basked in the kiss of the perfect golden hour light. Below us, a group of deer munched on grasses without a care in the world before stepping into the river and wading across. I felt like I was at the greatest movie theatre on earth, watching nature play out around us as though we weren’t even there. Need help with packing for camping? Read Mostly Oragnized’s camping checklist! 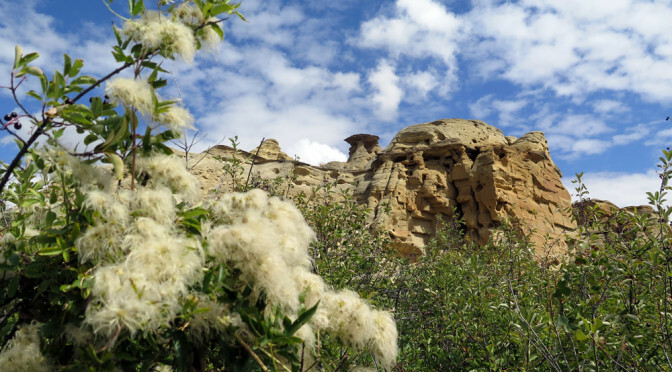 There are only two trails in Writing-on-Stone Park; the short Visitor Centre trail and the 2.2km Hoodoo Trail, which has a 0.5km offshoot called the Battle Scene Tail. 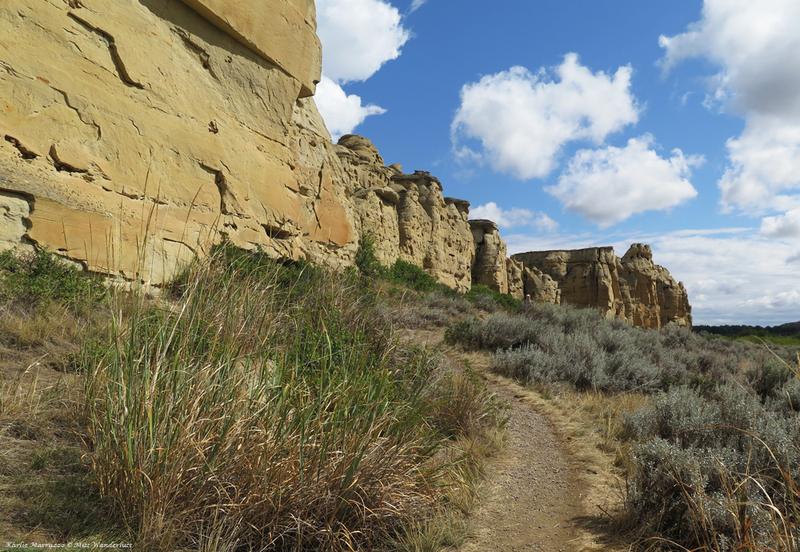 We decided to hike to Hoodoo Trail on the morning of our eighth wedding anniversary before it got too hot. 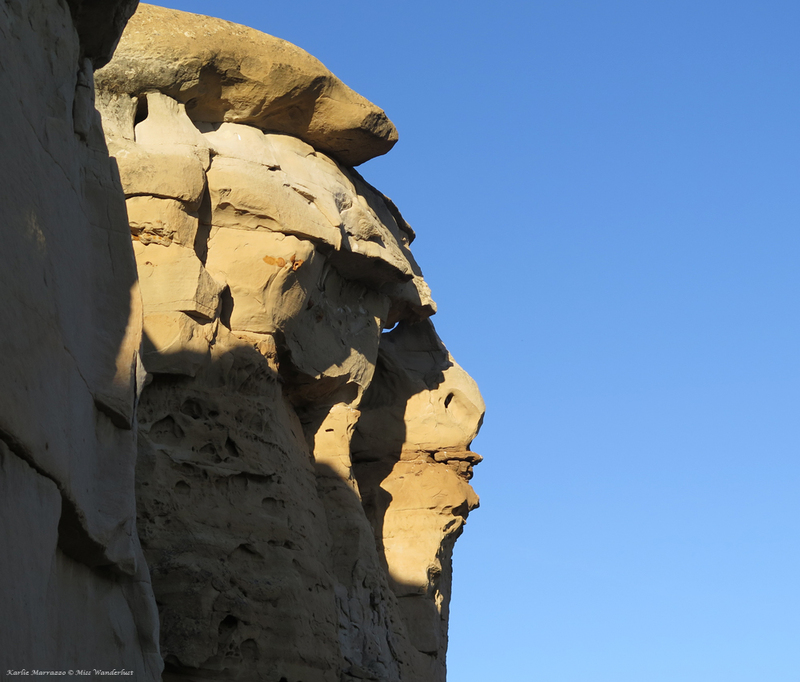 There had been a sign in the visitor centre warning that the sandstone hoodoos can get as hot as 40°C in the sun, and have even gotten up to 60°C. It was still overcast when we set out at 10am. 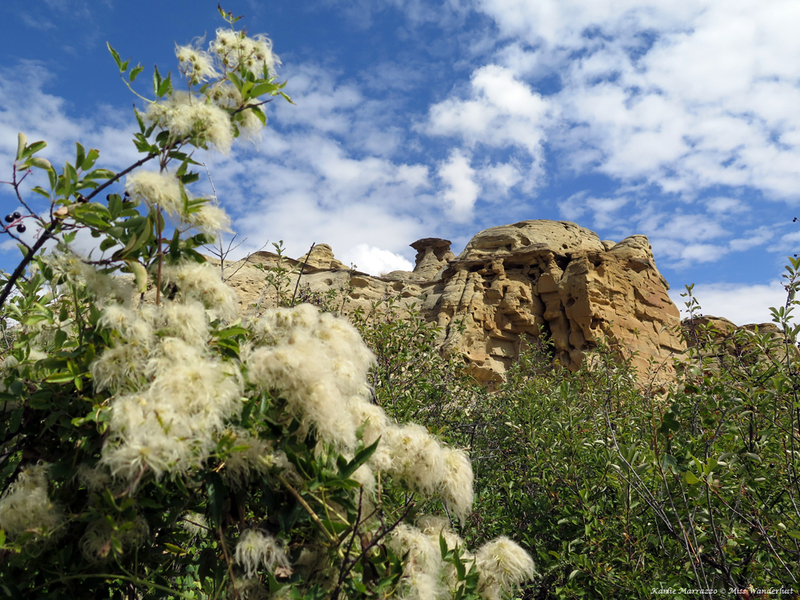 We walked through some foliage before emerging into a maze of hoodoos. There were no other people in sight. Even though the campground was completely full, we saw fewer than 10 people on the trail. It had rained the night before and our footprints were the only ones to be seen. The funky sandstone formations enveloped us on either side. 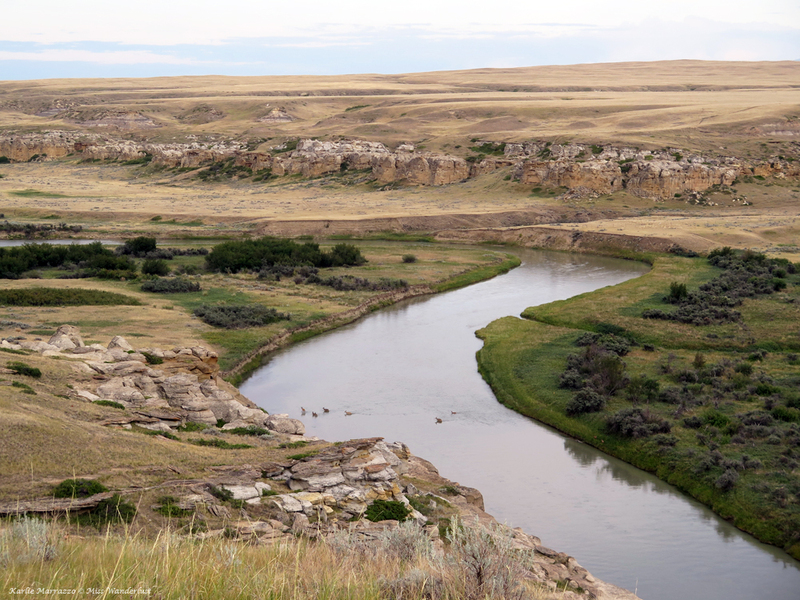 The park is on the UNESCO World Heritage Tentative List because the Milk River valley contains the largest concentration of First Nation petroglyphs (rock carvings) and pictographs (rock paintings) on the great plains of North America. 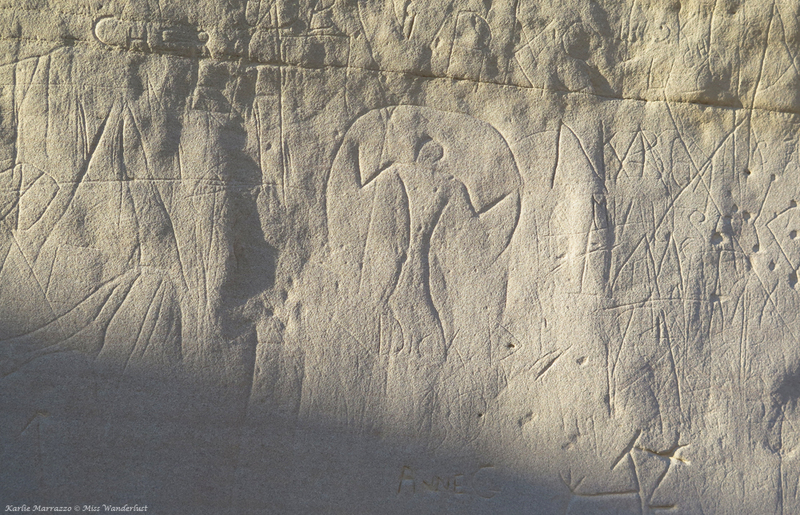 There were two places on the trail where we were able to see petroglyphs on our own – one spot behind a protective cage and the other open to the elements. 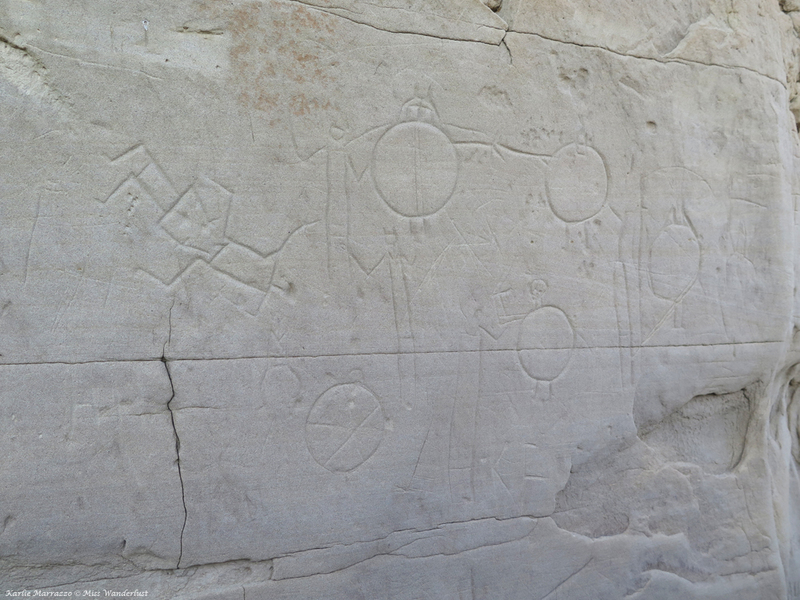 Even more prevalent than the rock art was the unfortunate site of graffiti covering almost every spot that was within reach. Although most of it seemed to be at least a couple of decades old, I can’t understand why a person in any era would want to vandalize such a spectacular place. On the topic of vandalism, I want to point out that climbing on the hoodoos is not allowed. There are signs all along the marked trail stating “Please keep off the trail.” I saw two female tourists clambering all over the rocks for a photo shoot and mentioned this fun fact to them. They replied with a sarcastic “Have a nice day” and carried on with their fun. It is our responsibility as travelers and human beings to preserve this Earth for not only ourselves and future generations of humans, but for the animals and plants that also call our Earth home. That evening we joined in on the guided Rock Art tour to get more up close and personal with the petroglyphs and pictographs. The tour is offered twice a day; we opted for the evening tour to avoid the brutal midday heat. Our guide was a Blackfoot woman who has worked at the park for several years and was able to provide a lot of personal insight and commentary as well as the standard facts about the park. She explained the legends and the stories behind the art which her mother and grandmother shared with her as bedtime stories, and have been passed down through generations of Blackfoot people before them. 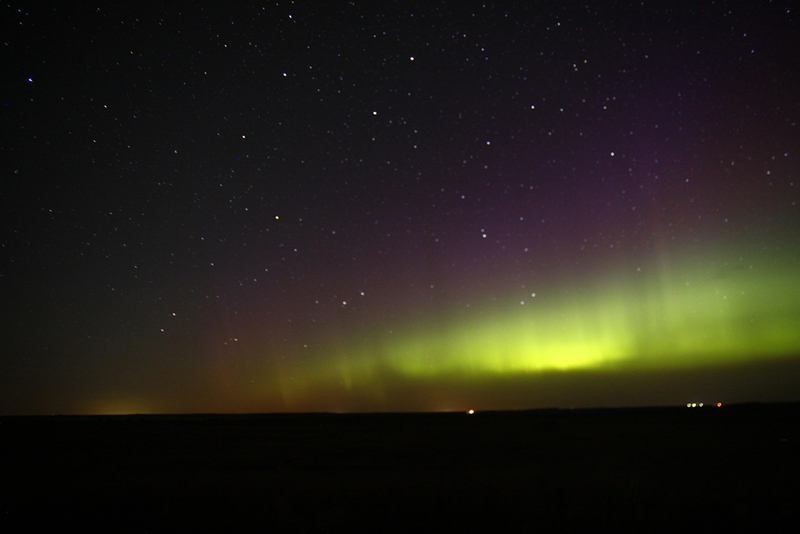 Once darkness had fallen, we found ourselves back at Police Coulee viewpoint. 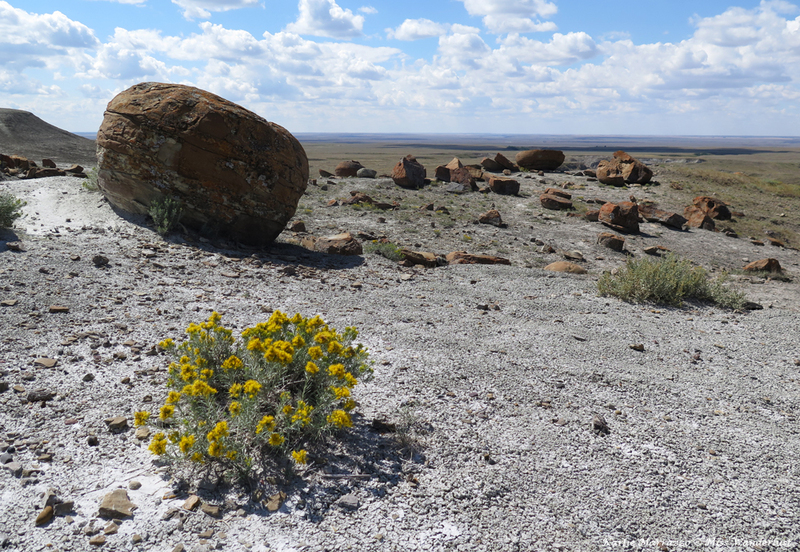 While Writing-on-Stone isn’t technically a dark sky preserve like Cypress Hills, it is completely isolated and surrounded only by flat, uninterrupted prairies. Even though it was the middle of August, it was slightly chilly outside, so I stayed in the car at first, contorting myself in the passenger seat so that the back of my head was on the dashboard and I was essentially staring straight up. The sky was even more alive that it had been two nights before, completely blanketed with white, red, blue and yellow twinkling stars. The Milky Way stained the sky in a thick brushstroke, and galaxies filled in the gaps. The sudden, piercing cries of coyotes broke the spell momentarily, and then stopped as abruptly as it started. I stepped out of the car to take in the full view and immediately became disoriented, stumbling over my own feet. The sky isn’t just a flat piece of glass where clouds dance above us, but a giant dome encircling the Earth. Feeling as tiny as an ant under a glass, I silently appreciated the immense beauty and complexity of the Universe, thankful, in that moment, to just be. Excellent writing about one of my favourite places and awesome pictures. Karlie, your writing skills are AMAZING ! I’m captivated by your every word & want to read more!! Write a novel, please!! To think this holiday is right in our backyard, I sure hope I get the opportunity to enjoy it soon…thanks for the story & pictures.